Queen duvet cover (88" x 88") featuring the image "He Shoots" by Hanne Lore Koehler. Our soft microfiber duvet covers are hand sewn and include a hidden zipper for easy washing and assembly. Your selected image is printed on the top surface with a soft white surface underneath. All duvet covers are machine washable with cold water and a mild detergent. Thank you, Radosveta, for the honor of featuring my painting in ART FOR KIDS group on 04/14/2019! I appreciate your kind support and promotion! Great action painting! Beautifully executed, as always. Thank you, Sandy, for the honor of featuring my painting in WE GATHER TOGETHER group! I appreciate your kind support and promotion! Thank you for your thoughtful comment and support, Mohammad! Marvelous work Hanne! Your ability to catch the action is outstanding! Thank you for your thoughtful comment, Jeff! Thank you for your thoughtful appreciation and support of my painting, Sunil! 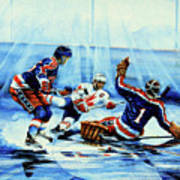 Wonderful composition and action painting, Hanne, and fabulous tribute to the great Wayne Gretzky - L/F! Thank you for your thoughtful comment and support, Michele! Thank you for your thoughtful appreciation, support and promotion f my painting, Cheryl! Thank you for your thoughtful appreciation and support of my painting, Jack! Thank you for your thoughtful comment and support, Carolyn! 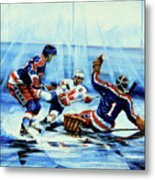 This painting really brings back the memories. 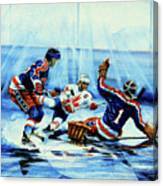 I was a huge fan of Jim Craig, Team USA's goal keeper in the 1980 Olympics. He is the reason why I started playing hockey way back when. When Wayne Gretzky played for the LA Kings I watched every game I could and was lucky enough to see him play several times and even met him once. This painting is amazing, thank you. I'm delighted that my painting brought back such happy memories for you, Shoal! Thank you for sharing and your wonderful compliment! Thank you for your thoughtful comment and support, Kathy! Thank you so much, Sunil! They called him The Great One for a reason. You captured that reason here in fantastic fashion. Thank you for your thoughtful comment and support, Shoal! Thank you for your thoughtful comment and support, Ray! Thank you for your thoughtful comment and support, DJ! Thank you for your generous comment, support and promotion, Donna! Thank you for your kind comment and support, Melly! Thank you, bill, for your thoughtful comment and support! Congratulations on your sale! Love it! Thank you for your kind comment, Carol! Thank you for your kind comment, Peggy! 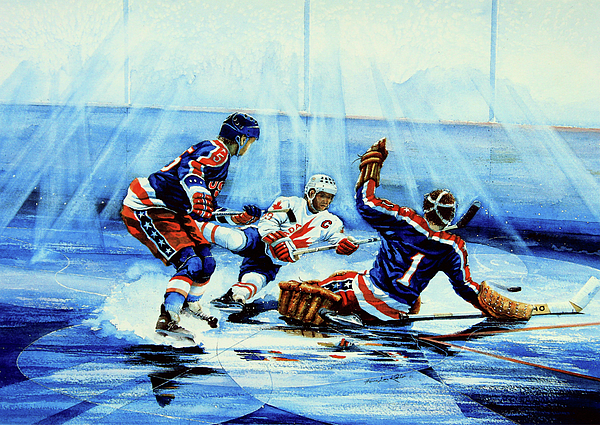 You do the most amazing sports paintings - wonderful work, Hanne. Thank you so much, Nikki! I appreciate your dear compliment! You are too kind, Debbie! I appreciate your dear support and promotion!